Qpedia Thermal eMagazine was launched in 2007 as a monthly newsletter focused on the thermal management of electronics. 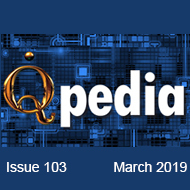 Now in its 9th year of publication, Qpedia is a highly respected monthly magazine that is distributed at no charge to over 18,000 engineers. Written and published by the engineers of Advanced Thermal Solutions, Inc., Qpedia is a technical resource to help the engineering community solve the most challenging thermal problems. Each issue provides practical approaches to thermal management challenges and explains the new technologies for successfully cooling today and tomorrow’s hot-running electronics. cooling to meet the thermal demands of certain hot components. fill the cold plate but is only transferred to areas that need to be cooled. around the world to address cooling challenges. instruments to advanced materials and concepts and more..
Sign Up For Qpedia's Monthly email.